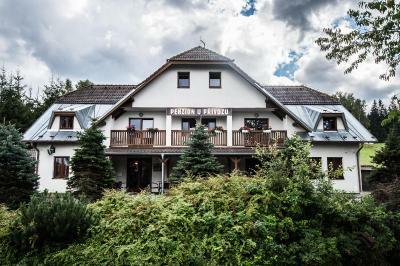 Lock in a great price for Penzion U Privozu – rated 8.4 by recent guests! 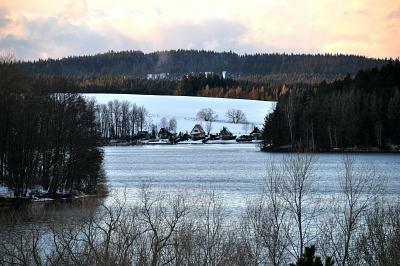 We enjoyed the area, far from touristy and ugly 'lipno nad vltavou' village. Ferry straight to nice little town - Frymburk - the nearest nice beach. Also staff was helpful and really friendly which is to say very rare in czech republic. Just go to any restaurant in frymburk if you need clear comparision. Breakfest was actually better than we expected. The apartment was much better than we expected-- it was the perfect size for our family, very comfortable and clean. The breakfast was very bad and very very limited. No value for money. Výborná kuchyně, velké porce. Ochotný personál. Klidné a hezké místo. Ubytování bylo čisté, Majitelé příjemní, ochotní a pozorní. Skvělá domácí kuchyně, vlastní paštiky, marmelády... neodolatelný domácí chléb a croissanty. V listopadu skvělé na oddych a odpočinek, všude klid. Krásná atmosféra kachlových kamen...., jako v pohádce :D.
Klidné prostředí s parkováním zdarma. 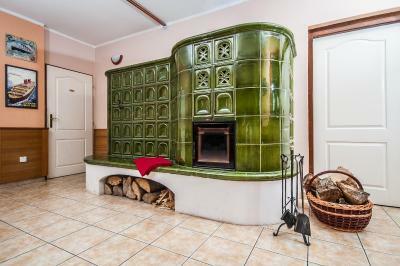 Vybavení pokoje a kuchyně v apartmánu. Majitel docela ochotný.Možnost vířivky. Personál vcelku příjemný, ochotný vyhovět požadavkům na dřívější check-in. V sezóně je možné využít přívoz přímo do Frymburku, který je opravdu "za rohem". Personál velmi ochotný a nápomocný. Penzion čistý, pokoj vybavený ledničkou, rychlovarkou, fénem, ovocná šťáva na pokoji zdarma. Večeře výběr ze 3 jídel, moc dobré. Penzion U Privozu This rating is a reflection of how the property compares to the industry standard when it comes to price, facilities and services available. It's based on a self-evaluation by the property. Use this rating to help choose your stay! 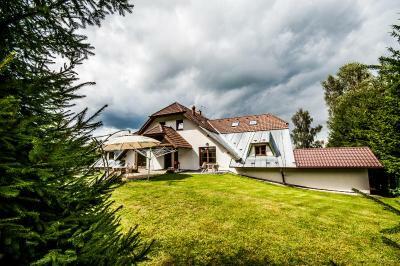 Penzion U Privozu is located 150 feet from the banks of the Lipno Lake and the ferry to Frymburk, on the edge of the Šumava National Park. 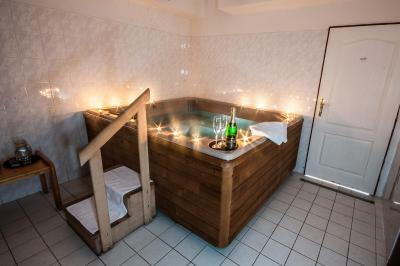 It offers you a spa area with a hot tub and a sauna, and Czech cuisine. Guest can also enjoy a private meadow. All rooms at U Privozu have a private bathroom, a TV and free WiFi. Cycling trails start right from the property. 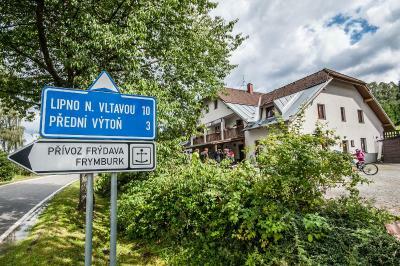 The center of Frymburk can be reached by ferry in 5 minutes. The Vyšší Brod Monastery is 11 mi away. Český Krumlov is 22 mi away and free private parking is possible in front of the Penzion U Přívozu guest house. When would you like to stay at Penzion U Privozu? This apartment has a stovetop, electric kettle and seating area. This apartment has a microwave, CD player and kitchenette. This triple room has a electric kettle, tile/marble floor and private entrance. This apartment has a electric kettle, balcony and stovetop. House Rules Penzion U Privozu takes special requests – add in the next step! Please inform Penzion U Privozu of your expected arrival time in advance. You can use the Special Requests box when booking, or contact the property directly using the contact details in your confirmation. We would appreciate a carpet or simply not so cold floor in the flat. Value for money not really great but again... comparing to other places around lipno this is actually fine. The breakfast was adequate, but could be improved. The host was kind enough to cook us eggs on the second day, but maybe some fresh fruit, less processed options would be nice..? Some staffs were unfriendly and breakfast.